Reminder: #RMNBParty5 is on Saturday! Home / Party / Reminder: #RMNBParty5 is on Saturday! We are just one day away from RMNB Party 5: Skate or Die! Go check out our original post or our Facebook event. Thanks to some well timed henriquing, there will in fact be a game to watch on Saturday night, and there is a decent chance we’ll even be together to watch somebody hoist the Stanley Cup. Not gonna lie: I will get emotional. The game is supposed to start at 8, but who knows what kind of nonsensical padding and human interest story fluff NBC will air beforehand. If Costas shows up, you know it’s gonna be bad. Frankly we’re quite relieved that there will actually be hockey on Saturday. Our contingency plan involved a series of Oxford style debates on the following topics: For whom should the Capitals inevitably trade Alex Ovechkin? When the Capitals acquire Zach Parise in July, should he serve on the penalty kill? Should Rick Nash get the A when he is definitely signed to the Caps? and Alex Semin: is he enigma, a puzzle, or just a dude who doesn’t speak English? Thank goodness we don’t have to do that. Anyone caught discussing the above will be flogged. Before the party, we’ll be skating at KCI– right across the street from Front Page. The public skate is from 6-7. It’s first-come, first-serve, and if you act like a goon we’ll disavow you and tell everyone you’re from Japers Rink or something. KCI’s rules for the public skate are at the bottom of this post. Back to the party: Front Page is kind enough to offer $2 Bud Light drafts on special. If you’re doing the public skate, you can take your skate pass (and a front-facing photo ID) to the Sports Page deli at KCI for a free beer before coming over. Obviously, our team’s season is over, so please don’t feel obligated to wear your Caps red. In truth, a Russian Machine t-shirt may make you our instant BFF, but please feel free to dress however you like. 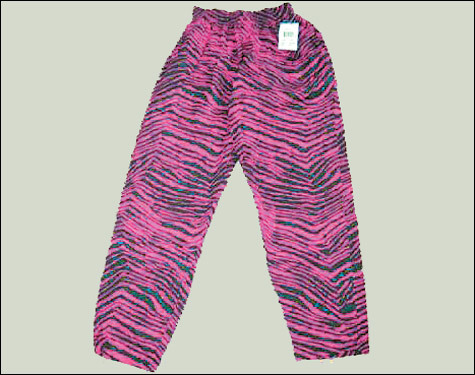 For example, Ian will be wearing crocs, zubaz, and a Devils jersey from the mid-90s. If you’re making any social media noise about the party, the hashtag we are futilely asking you to use is #RMNBParty5. Here are those lightly paraphrased guidelines from KCI that I promised you above. You can read the whole public session tips PDF here. The rink is chilly—don’t forget your sweatshirt or coat. Helmets are recommended for young skaters. Gloves are encouraged. Wear long pants and socks that come above the ankle. All public sessions are subject to a capacity limit. Passes are sold beginning 30 minutes before the session starts. Winter weekends are very busy; please plan accordingly. All ages and ability levels are welcome on public sessions. Skates must be worn on the ice for public session. No shoes on the ice! Both hockey and figure skates are available for rent. No cameras, cell phones, or headphones on the ice. Please do not skate through the center of the rink. The center of the ice is for private skating lessons and for skaters to work on maneuvers. No cones, buckets, or walkers are allowed on the ice to assist skaters. These create a danger for other skaters. No hockey sticks or pucks permitted on public sessions. KYLE. Lockers are available for $.50. KCI is not responsible for lost or stolen items. Consider leaving extraneous items at home or in the car. Finally, here’s the new song from Silversun Pickups, who are kinda/sorta from L.A.